In an interview on Italian TV on his new book, 'Democracy in Europe', co-authored together with French MEP Sylvie Goulard, Italian Prime Minister Mario Monti was asked by the host whether Europe has "a British problem". 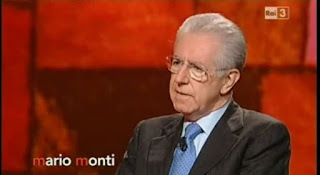 "Britain rather considers it a 'Europe problem' [Monti laughs, but no-one else in the studio seems to get the sarcasm]. Yes, there is a British problem… [but] I’m one of those who says that Britain has to be kept in the European Union." "It is good for Britain to stay in the EU and it is good for the EU that Britain stays in. The euro is a different thing. I’m not sure that, at the moment, it would be good for Britain to have the euro and for the eurozone to have Britain in. But there are aspects of European life that go beyond the euro. The single market, foreign policy, defence policy (one day)…The British can, however, be rather frustrating when they seek, as a condition to stay aboard this big European ship, specific exemptions, specific derogations that would ultimately be equivalent to opening holes in the ship and making it harder to navigate, not to say sink." "Now, there are some in Europe who would, after all, feel relieved if Britain were not in. I think some French belong to this category. I am convinced that a compromise with the British has to be sought and, above all, it is necessary that, one day – and I spoke about this with David Cameron last week – the British ask their electorate not, ‘Do you agree with this further change that other [EU] countries want to make’, but ask the fundamental question, ‘Do you want [your country] to remain in the EU?’ I’m sure that, at that point, faced with such an important set of choices - banking interests, financial interests, industrial interests - they [British voters] would immediately say, ‘Yes, please’." Good article and keep up the good work OE. Given that the latest surveys show 54% or 56% (depending where you look) of the British population would like to leave the EU one would have to judge that Monti is out of touch with the UK debate. I suspect that the German public may get more involved over the next couple of years when they realise the costs of guarantees they have made and alternatives to Merkel will gain prominence which will challenge the viability of the Eurozone and the EU outlook substantially. I find it both frustrating and frightening that decisions are taken by Eurocrats without reference to an informed electorate. Whatever one's opinions may be of our European cousins (particularily Greece) one should not wish the hardship on them that they are currently undergoing in order to remain in this pseudo utopia if one believed in this European ideal, rather they were managed out in an orderly exit until they could return to the fold if they so choose. The problem is, of course, that they now may choose not to rejoin their brethren who have imposed such hardship upon them. An alternative to the current Eurozone should be promoted that would allow countries to leave and possibly re-join as their economies and electorate dictate. The problem with this course of action obviously is that the Eurozone is likely to be a lot smaller, more fragile, and possibly less significant. However the welfare and well being of our European neighbours is surely more important than a suspect political ideology. I am pleased that we now have this debate in Britain. Inform the European electorate of each country, fairly and without coersion, and allow them to give a democratic mandate to proceed or backtrack. For the will of the people will, eventually, decide. An appopriate answer would be: 'great idea, let's make it even better and have a referendum in all of Europe on the issue'. A lot of people would get very nervous when that happened. The problem in Germany is that the German people donot have a real choice. All mainstream parties are pro-Europe (in degree and with different accents but at the end of the day pro-Europe, even if the majority of their people thinks otherwise on an issue. Simply looks like we see some sort of play (with Mutti and Schauble as Punch and Judy)performed in their parliament but little to do with the original tasks of a parliament. New parties can difficultly come up because of the electoral system and the basic conservative nature of the German. Imho the best thing would be if one of the existing parties would change their pov. Basically 2 candidates CSU and FDP. Of which the FDP is by far the likelier. They are under heavy poll stress. -no funny expiriments and when these donot work stop them. So basically anti-bail out and no 'when the Euro fails Europe fails' stuff. Different from the UK as the position of Germany in Europe and the ideas of the German people are simply different. There is likely a 30+% potential electorate (as Holland with the VVD showed and the Dutch are basically more progressive than the Germans, still there is much room for a rather conservative party). And rising, because people leave more and more the church. It could become a big party and close to the centre of power. Plus this set up is close to the original 'brand', so not completely irrealistic. "So Monti has waded into the British referendum debate, effectively calling for an in/out choice. It is perhaps a bit ironic that an unelected head of an unelected technocratic government chose to comment so explicitly on how other democratic countries ought to involve voters in key decisions"
Is there a problem on issuing an opinion about the status of the UK in the EU ? For OPEN EUROPE it seems as it is. Not so open this OPEN EUROPE blog ! I might just turn to other more OPEN blogs. Who cares what an unelected, Eurofascist "leader" has to say about democracy? It's like listening to what a snake has to say about shoes. Although the UK democratic system is very far from perfect we have at least managed to avoid outright dictatorship and I don't think we have anything useful to learn from the Italians about democracy, and least of all about referendums. However as it happens I do agree with him that we should have a referendum on what is the heart of the matter, whether we want to be part of the process of "ever closer union" mandated by the EU treaties. ""Under the present treaties of the European Union the United Kingdom is committed to a process of "ever closer union" with the other countries in the European Union. Do you wish the United Kingdom to continue further with this process of "ever closer union"?" If the answer was "No, we don't want to continue further with the process of "ever closer union" with the other countries in the European Union" then the UK government would have to seek very different treaty arrangements with those other countries. Either alone, or in concert with some of those countries where the peoples also felt that they'd already gone far enough or too far with that process and they didn't want to go any further. Could we stop all these anonymous messages and just have pseudonyms instead? For instance are the 3 above all from the same person? Most of us here have worked out for ourselves that 'picking and choosing' from the EU's competences is a non-starter and realistically have concluded that we should leave and build a totally new relationship from scratch. It looks as though that is now the majority opinion here. As for Mr Monti his credibility here as an ex-Commissioner (and thus responsible for the euro-shambles ) and an unelected and EU-appointed head of a puppet government . . his credibility here is zero. "the welfare and well being of our European neighbours is surely more important than a suspect political ideology". More important to whom? To us and to most of those people perhaps, but certainly not to those whom Ambrose Evans- Pritchard recently called "sado-masochists" for what they are doing to those poor people. Furthermore, Mr.Klaus stated in his speech with the Bruges Group this week that the EU elite are utterly determined to keep the euro intact however severe the problems it causes the failing countries. They cannot of course, not indefinitely, because the people will not put up with it indefinitely so all that remains is to see how it is finally blown apart. Mssrs. Monti and Blair, both of whom have from time to time shown precious little interest in the will of the people, are not best placed to comment on what the British people want. Only a referendum which asks the appropriate question can do that and the appropriate question is - as Mr. Cameron insisted correctly for the Scottish referendum - do we want to stay in or come out? It is in fact rather ironic to see Mr. Cameron, having refused (correctly) to countenance "devo-max" for Scotland in the UK context, to seek to negotiate something analogeous for the UK in the EU context. Rik, I read in the European press a couple of days ago about a German Politician who is in charge of a Political party that is less, perhaps even anti, the European ideology but, frustratingly, I cannot locate the article to be able to quote his name, apologies. Christina, I was the author of initial 'anonymous' comment, I did not post the others. "They cannot of course, not indefinitely, because the people will not put up with it indefinitely so all that remains is to see how it is finally blown apart." I agree entirely, the question is when will that happen? You have to ask who is Monti getting his advice from? certainly not Dan Hannon or any of the ukip members. Monti is correct to say that there is more to European life than the Europe. How about case 353/85, Commission vs UK government, judgement given by European Court of Justice, (a misnomer if ever I came across one)23/2/88? The Commission took us to the Court because we were not levying VAT on spectacle lenses. I am severely myopic, and need lenses to see to function. Thanks to Our Partners in Europe, I must pay a tax because of a genetic flaw about which I can do nothing. What has taxing the visually impaired got to do with peace in Europe? Do I want to get out of the EU? You bet! Monti's suggestion has one specific purpose and that is to avoid reform of the Union. Exactly what he and the cotery of politicians in Italy are doing and have been doing for the past 30 years. With Britain in, majority voting will preclude any attempt of reform, with Britain out the same will happen. Rather, the issue is what does Britain do? The European issue is now a farce which will drag its citizens not 'in ever closer union', but 'ever deeper despair'. Like any farce it's evolving into a tragedy. If British society finds its own reforming momentum, than you will see that the European issue will turn into a non issue in the hearts and minds of the British people. What a farce, having the unelected Mario Monto stating that we should be given an in/out referendum and that we would all vote to stay in the gravy train and continue to subsidise all the peasant countries is ludicrous. I see that UKIP did well last night in the 3 by-elections. I don't know what it will take to get Cameron to note what is happening to our support. He is so arrogant that he ignores the views of the majority of the British people. It is becoming apparent that we will end up with another socialist government in 2015 with ever more borrowing and squandering that nearly bankrupted us the last time around. We will certainly know who to blame for this potential nightmare. Monti has a valid point , in so far that the British people's vehiment euroscepticism must have an unsettling influence on the EU. It makes it difficult for any UK government to deal harmoniously with the EU . Where Monti is wrong is in his belief that the people will vote to stay IN , becauses it's good for the banks , financial services and industries . British government or industries . An IN/OUT Referendum in Britain will get the result OUT , no matter the government's endeavours to persuade the people to vote IN . As to leaving for a while and then rejoing , my answer is NO , NEVER !!! The only reason Monti thinks it is a good idea is because he knows that when it happens (as it will) it will not be a fair contest with a properly framed question and equal airtime to both sides of the debate... he knows that the entire political establishment of the UK is pro-EU, the BBC is and most of the newspapers and the EU will channel vast resources into bribing and cajoling the stupid into voting to stay in plus the question will be jettymandered in a "do you want to leave the EU and cut your balls off or stay in and enjoy puppies/endless free beer" type way. Anybody regrading victory in a referendum is fooling themselves big time - things in europe have to get a lot worse before we can be reasonably sure of getting out. A major problem at present is sheer ignorance of the process required to enable a reasonably painless exit; when was the last UKIPer to mention invoking article 50? This is starting to happen thank good ness and I do think that in 3-5 years article 50 will be a part of the political lexicon, the only real question is which of our useless stupid political parties will ensure eternal victory and historic glory by embracing it? This is an historic opportunity for Farage which he looks like bumbling. Nice fellow but dangerously useless.